Astronomers have found signs of water ice clouds on an object just 7.3 light-years from Earth—less than twice the distance of Alpha Centauri, the nearest star system to the Sun. If confirmed, the discovery is the first sighting of water clouds beyond our solar system. The clouds shroud a Jupiter-sized object known as a brown dwarf and should yield insight into the nature of cool giant planets orbiting other suns. Kevin Luhman, an astronomer at Pennsylvania State University, University Park, recently discovered the nearby object by using images from NASA’s WISE infrared space telescope, which scanned the sky from 2010 to 2011. A brown dwarf is a failed star and has so little mass that it can't sustain nuclear reactions, so after its birth it fades and cools. This brown dwarf, named WISE J0855-0714, is the coldest known. Its temperature is slightly below the freezing point of water, so it's colder than Earth's mean temperature but warmer than Jupiter’s. "I've been obsessed with this object since its discovery," says astronomer Jacqueline Faherty of the Carnegie Institution for Science in Washington, D.C. The new neighbor resembles a giant planet—it's as large as Jupiter and 3 to 10 times as massive—but is solitary, which means it has no sun whose glare interferes with our view of it. Moreover, it's nearby: the fourth closest system to the Sun, after Alpha Centauri, Barnard's Star, and Luhman 16. Still, because the object is small and cold, it's so dim that no ground-based observatory had seen it. "I went to battle at the telescope to try and get this detection," Faherty says. "I wanted to put war paint under my eyes and wear a bandanna, because I knew this was not going to be an easy thing to do. At the telescope, I've never been so nervous. I've never wanted clear conditions so badly." For three nights in May, Faherty used the 6.5-meter Magellan Baade telescope in Chile to acquire 151 near-infrared images that she later combined to yield a detection. "I'm absolutely elated," she says. 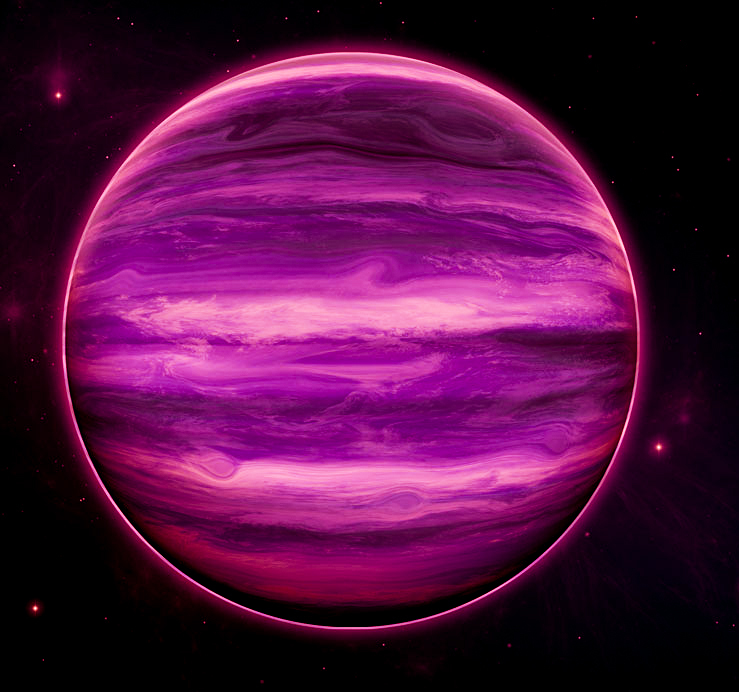 Moreover, as her team will report in The Astrophysical Journal Letters, the observed colors match models of a brown dwarf with clouds of water ice and clouds of sodium sulfide. "It's incredibly interesting," says Jonathan Fortney of the University of California, Santa Cruz, an astronomer who helped develop those models but was not involved in the discovery. "It's tentative," he says, but "it's the first evidence for water clouds" outside our solar system. Even within the solar system, observers can see water clouds on only Earth and Mars; the giant planets are so cold that ammonia ice clouds cover the water clouds on Jupiter and Saturn while the atmospheres of Uranus and Neptune block the view there. Observers have previously discerned water vapor in the atmospheres of extrasolar planets, but Fortney says water clouds are a new phenomenon. "One of the things we don't really know is how common partly cloudiness is," he says. Venus, whose clouds consist of sulfuric acid, is totally cloudy, whereas Earth is partly cloudy. Faherty says the brown dwarf is also partly cloudy: About half is obscured by clouds. Verifying the discovery will require spectra. Because the object is so dim, this will likely await the James Webb Space Telescope, which will be launched later this decade.